BIGFOOT NEWS AND RUMOR MILL: The Bigfoot Roundup, Fish Lake Migration, Biscardi Group Busted, Vocalizations, Yeren Writing Project and More! 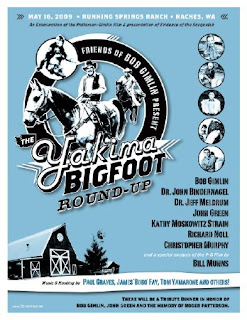 Well, it looks like we're heading into a big Bigfoot summer, starting things off with a BIGFOOT ROUND-UP May 15th and 16th, with BOB GIMLIN himself up in Yakima, Washington. Of course, for those of us who did not know about it on the first day, tickets are sold out. 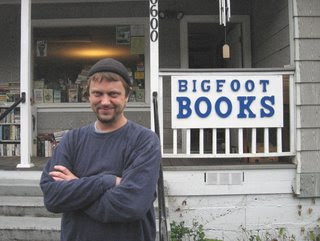 We at BIGFOOT BOOKS, however, are lobbying for some standing-room-only admissions. There is a waiting list, but JAMES BOBO FAY has told me that even Peter Byrne couldn't get bumped up to the top of the list! Bobo says: "This thing is going to go off!!! It's truly going to be a historic event. Hancock House is even doing a book about it. ...plus, the people who are calling for last minute tickets are true luminaries. We got some real VIPs coming." Well, bummer! Maybe we can convince them to hold it out in the old rodeo grounds or something? 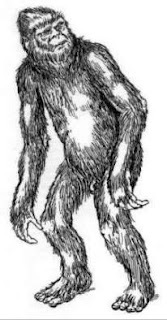 * It was rumored around town back in the fall that Tom Biscardi (yes, he of GEORGIA GORILLA HOAX fame) and/or his Crew has been busted by the US Forest Service for doing unauthorized "improvements" to the BLUFF CREEK ROAD and the small spur down to the PATTERSON-GIMLIN FILM SITE. Well, this isn't verified information (inquiries to the USFS produced no answers, so don't accuse me of slander, Tom), but I'd believe it. Does anyone smell... money? Word was that they planned to do regular paid guided tours down to the film site. It would be a shame to commercialize and despoil the sacred ground of Bigfooting in this way. * Trinity County field researcher SEAN FRIES of the Bigfoot Research Project (view his interesting "blobsquatch" photo here: http://www.searchingforbigfoot.com/Sean_Fries) and some associates heard nocturnal vocalizations outside of FISH LAKE. Fries also heard similar vocalizations this last summer near his home in Weaverville. Sean's work also will appear in the new BF book, "Who's Watching You," by Linda Coil Suchy. 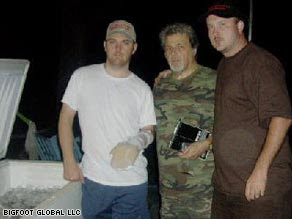 Sean is also tentatively scheduled to speak at the upcoming WILLOW CREEK BIGFOOT DAYS event, Labor Day weekend, 2009. * A report came in to BIGFOOT BOOKS from a seemingly quite believable (but for now anonymous) local mountain man and fisherman. He regularly does a trip in October up to the Fish Lake area. He fishes the lake and surrounding creeks. One such tributary, exact location to be withheld at his request, has been the site of repeated yearly BF signs including hoots and howls, roars, smashing and breaking of rocks and wood, broken off trees, etc. As this happens similarly every year this fellow suspects that it may be a migratory route. On his most recent trip he could clearly hear larger, male-sounding individuals coming down the creek, making what were obvious warning sounds (he knows this because they were terrifying). These were followed further back by communcating vocalizations that seemed to be coming from females and juveniles. If this is true it would seem that we have a family group living in the area up there near BLUFF CREEK. 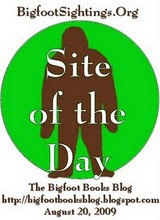 * BIGFOOT BOOKS and myself were blogged by TOM YAMARONE, fine Bigfoot folksinger and investigator, on BIGFOOTSONGS.COM. 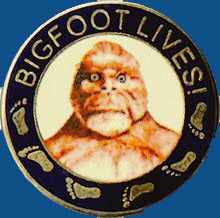 Look for an upcoming blog entry on him here, or listen to his great, amusing and historical bigfoot songs on the YouTube bar at the side of this page. Yamarone makes this interesting statement, "Steven is in touch with Al Hodgson, Willow Creek's long-time bigfoot ambassador, as well as the folks running the museum in town. Al Hodgson has always been generous with his time and information to amateur researchers and enthusiasts and as time goes on, Steven will slowly assume this role." Is this my JOB now, Tom? To be put alongside Al, though an honor, seems daunting--that's like a seventy year commitment! Check out the Bigfoot Bard's blog at : http://www.bigfootsongs.com/. The entry about the book shop is dated Friday, March 06, 2009. The X'ian China Bigfoot Writing Class Project! Teacher Christa Harrison used Bigfoot as a class writing project, and this blog was required research reading (the Humboldt County Bigfoot article in particular). Some interesting results have arisen, and will be posted here once final revisions and author bios have been completed. Ever heard of the YEREN? More to come, and soon! REMINDER: Potential speakers for WILLOW CREEK BIGFOOT DAYS 2009 should contact me ASAP. So far we potentially have HSU professor RICHARD STEPP and SEAN FRIES, maybe Bobo and the gang if they can make it. See the blog entry below for details. 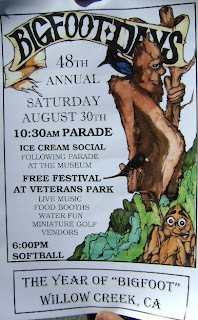 Image: Poster from the 2008 Bigfoot Days event.